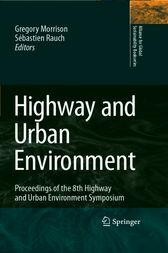 The 8th Highway and Urban Environment Symposium (8HUES) was held on 12–14 June 2006 in Nicosia, Cyprus. 8HUES was hosted in Cyprus by the Cyprus Institute. HUES is run by Chalmers University of Technology within the Alliance for Global Sustainability (AGS). The following facts provide a background for 8HUES: • 150 abstracts for posters and papers were accepted • 80 delegates (24 female) attended the symposium • 23 countries were represented, including all continents • 71 oral presentations at the symposium • 20 poster presentations • 50 written manuscripts for these proceedings HUES was initiated by Professor Ron Hamilton at Middlesex Polytechnic (now University) in the early 1980s. The initial aim was to measure and assess challenges in highway pollution. These challenges particularly - cluded urban photochemical smog, with an emphasis on ozone formation and particle release. The first symposium was titled “Highway Pollution” and had a clear aim to make a difference. The proceedings were published in an interdisciplinary journal.